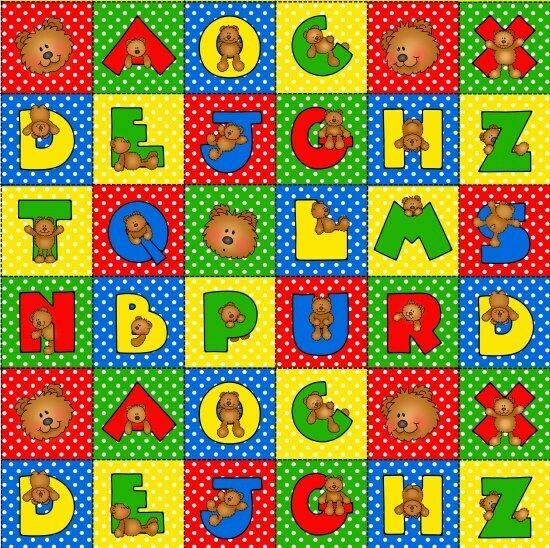 A fun and playful cotton children's fabric with bright primary colors of blue, red, yellow, green, white and brown is what you will see in this fun children's fabric. The alphabet blocks measure 3 inches inches square. You can easily add a border to this fabric or not! Choose a brightly colored backing and cotton batting and you will have a perfect gift for any child or anyone young at heart. A great additional to any child's bedroom or nursery. All fabric from The Quilted Nursery Children's Fabric Store is cut directly from the bolt in continuous yardage. We now offer fractional yardage for an easy shopping experience. Same day shipping always! We do combine shipping and refund overage on shipping when fabric is shipped. We will set up custom order if you prefer! So Cute! Will make a quick baby boy quilt with only adding a matching border. Thanks!